Provide comfort for the family of Alvin Presnell with a meaningful gesture of sympathy. Alvin Leon Presnell, 73, passed away on March 4, 2019 at a local hospital. He was the loving husband of Boyte Presnell and enjoyed 53 years of marriage with her. Born in Prichard, AL, Alvin was the son of Jessie and Bonnie Presnell. He was a graduate of Blount High School and Alabama A&M University. After graduation, Alvin taught History and was the head football coach at Marengo High School. His career path changed when he became an Allstate Insurance Company agent for forty plus years. In addition, he was an entrepreneur, owning and managing residential properties and several other businesses. He was passionate about renovating properties and often felt a strong sense of accomplishment when a project was completed. 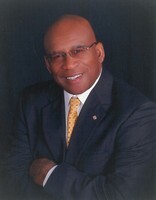 Alvin was an active member of Highpoint Baptist Church and also a member of the AAMU Alumni Association. He enjoyed traveling, sports and family gatherings. He will be remembered for his sense of humor, his solid work ethic ,and his love of family, friends and Alabama A&M University. He is preceded in death by his parents and brother, Jesse Presnell. Alvin is survived by his wife Boyte, his son Alvin Jr.(Melissa), granddaughter Alexis, nieces that he called his “girls” – Deirdre Hall (LaKeith), Kelsie Hall and Sonja Patrick; his brother Donald Presnell, sister Martha Presnell, sisters-in-law; Arletha Patrick, Mary Presnell and Dora Austin; brother-in-law Freddie White and a host of nieces, nephews, cousins, goddaughter and friends. To send flowers in memory of Alvin Leon Presnell, please visit our Heartfelt Sympathies Store. Provide comfort for the family of Alvin Leon Presnell by sending flowers. May the family of Alvin Presnell please accept my sincere condolences hoping you find comfort in God's words at Acts 24:15 and Psalm 37:29.